When an event is scheduled for April 1, you always have to wonder whether, just maybe, it’s a hoax. We’re here to assure you that is not the case with the Fools Gold Artists’ Fund annual Art Auction and Paradise Pink and Blue Ball, despite a curious name and some very silly affiliated acronyms. But make no mistake: Some jesting is involved, as are wondrous hats. Former Burlington musician and artist Diane Horstmyer founded the fund a decade ago as a means of helping local artists with projects in process. The money — er, “magical currency” — raised Friday night supplies the pot of “fools’ gold.” From this, individuals or small arts organizations may apply for modest grants throughout the year. In the past few years, the auction has generated $1500 to $2000, according to Phinneus Sonin. He, Dre Falzarano and Genese Grill make up the merry trio that now manages the nonprofit “spiritual organization” called FLUFF — Fools Launching Unusual Flights of Fancy. For Friday’s event, volunteers will “help set up and break down the pink and blue fluff that turns our changing venues into wonderlands,” according to the group’s press announcement. And, no, they don’t mean that gooey marshmallow stuff. This year, FLUFF is giving out a new grant — dubbed F.L.A.C.K.S., or Fools Loving Art and Community in honor of Kathleen Smith — named for a founding Fool who was killed last fall and earmarked for someone who “most embodies [her] spirit.” The local cabaret Salmagundi donated the proceeds of an earlier performance for this grant. 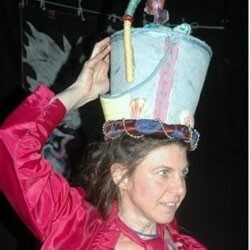 In addition, at Friday’s ball, millinery mistress Kathleen De Simone will offer two handmade hats, as she does each year: one for the Top Drawer (person who made the piece of art that got the highest single bid) and one for Top Bidder. Friday, April 1, 6-11 p.m. at the BCA Center in Burlington. Live music by Villanelles, the Steph Pappas Experience and Diamond Tiger. $7. Donations for the auction may be dropped off in advance at Jamba’s Junktiques, 324 North Winooski Avenue; label with name and contact information. For more info, email fluffart@gmail.com.